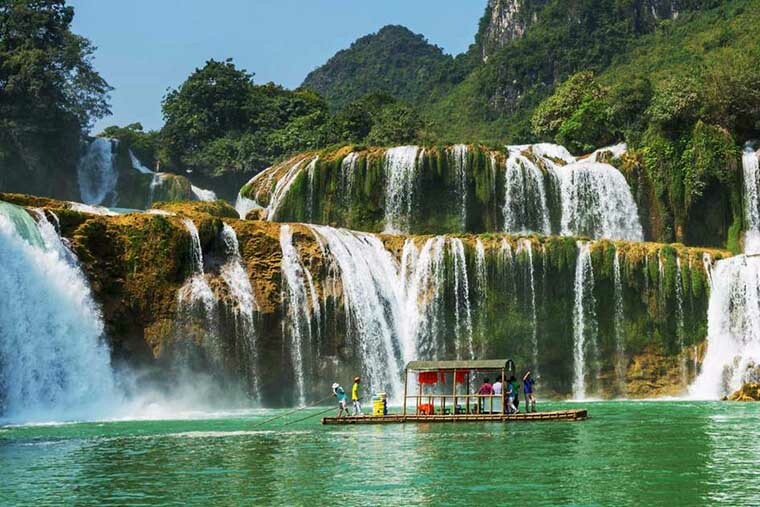 Deep inside mountains covered with dense jungle in Vietnam exist the most stunning waterfalls from North to South, some of which should not to be missed in this hot summer. Some of the most gorgeous water falls are listed in the following article. Follow our step to discover more. 7km far from the northeast of Tam Giang Commune in Dak Lak Province, Thuy Tien Waterfall is one of the most beautiful waterfalls in Vietnam. It is a poetic charming waterfall with many stones of various shapes and sizes fitting carefully to overlap each other as time goes by. Visiting this place, visitors can immerse themselves in the beauty of nature and listen to the sounds of all species in the majestic forest. Water flows down onto rocky terraces creating white smoke - like a mesmerizing, lively picture of mountain landscape of the Central Highlands. Along with beautiful waterfalls such as Trinh Nu, Dray Sap and Krong Kmar, Thuy Tien Waterfall is one of the great places to visit. Like a fairy hidden in the Central Highlands forest, Thuy Tien Waterfall invites visitors to come and admire its romantic and charming beauty. Voi Waterfall is located about 25 kilometers southwest of Da Lat City of Lam Dong Province in Nam Ban Townlet, Lam Ha District. The waterfall is 30m high and about 15m wide, which makes it appear as elephants swimming together. The waterfall is also associated with a faithful love. Through the stone ridge flows transparent water creating spectacular scenery. Especially, visitors are offered breath-taking view of beautiful rainbow when waterfall is illuminated by sunlight. 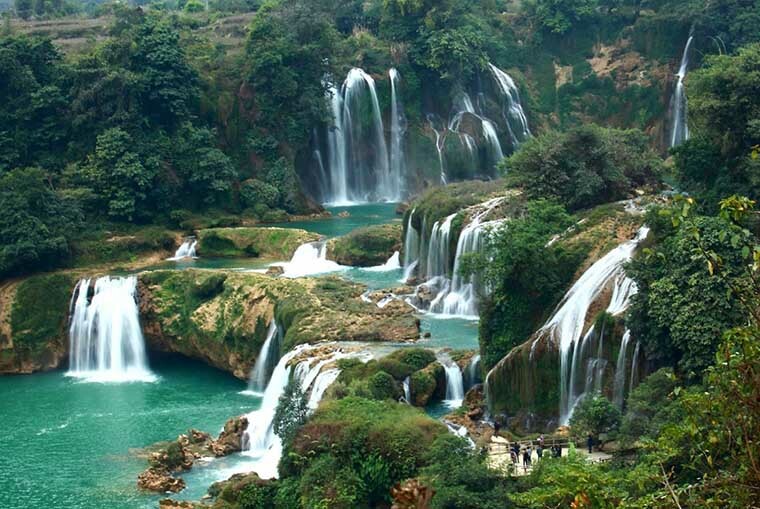 It is, thus, undoubtedly known as one of the most beautiful waterfalls in Vietnam. About 50km away from Ho Chi Minh City, Giang Dien waterfall is a peaceful place. 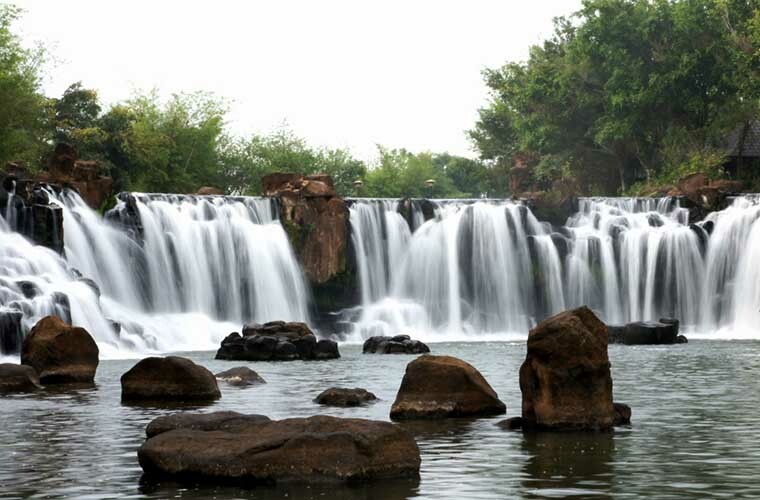 In spite of being not very popular among foreign tourists, Giang Dien Waterfall provides a practical eco-tourism system for tourists to discover and relax. Located in the southern part of Dong Nai, Giang Dien Waterfall is surrounded by hills, valleys, forests and plenty of flowers blooming all year round, creating a peaceful space. 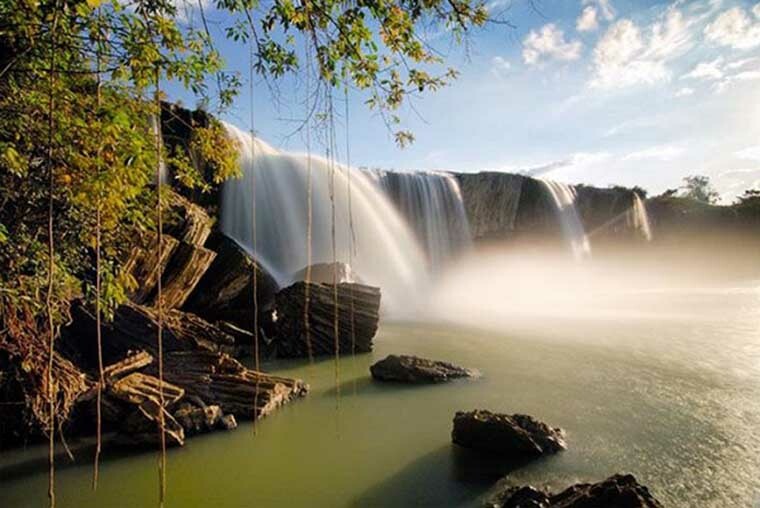 Gia Long Waterfall is well-known for being one of the most beautiful waterfalls in Vietnam. This majestic waterfall is considered one of three famous waterfalls in the Central Highlands of Vietnam including Dray Sap, Gia Long and Trinh Nu running through Dak Nong Province. This waterfall is named after a Vietnamese king called Dray Sap, who came and relaxed here because of its own majestic and peaceful landscape. 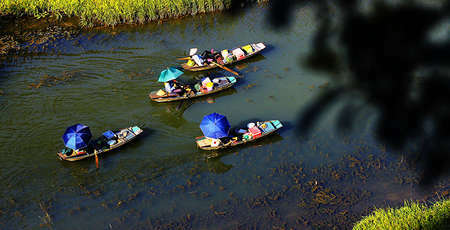 About 150km away from South of Hanoi, Thanh Hoa province is home to many limestone peaks, rice fields and rivers. 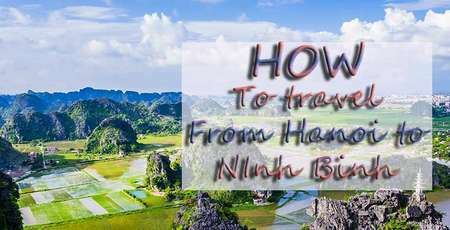 The landscape of Thanh Hoa is similar to its neighboring province Ninh Binh. Thanh Hoa is famous for Sam Son beach, Pu Luong National Reserve and one of the most hidden secret of the country: Hieu Waterfall - also known as Thac May. Less likely to be known internationally as it may seem, May Waterfall is a very romantic and beautiful place. 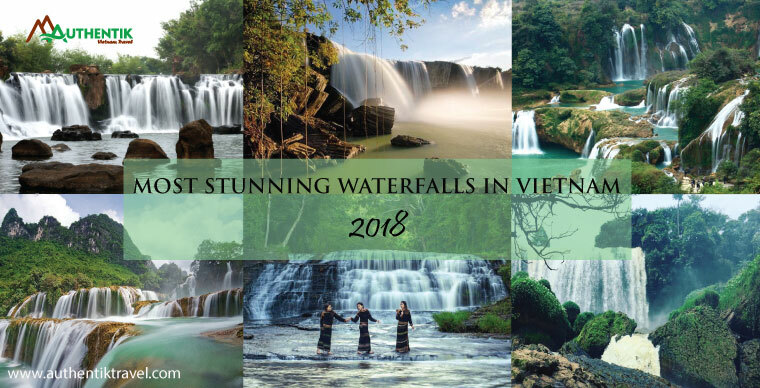 It takes about 1 hour to walk up to the top of this waterfall but you will realize it's worth the time when you get there since it deserved to be included on the list Top most beautiful waterfalls in Vietnam. 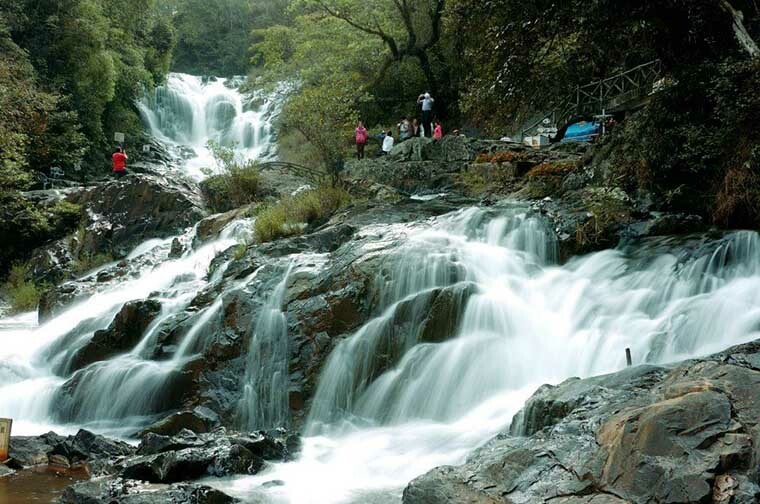 Dalat is also known as "the city of waterfalls and lakes" which include Prenn – one of the most famous waterfalls in Vietnam. 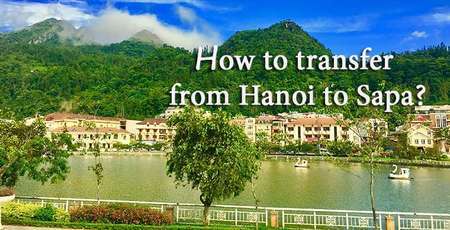 It is located at the foot of Prenn Mountain Pass, only 10km from the center of Da Lat city and Prenn means "land of aggression" in Cham language. According to local people, the waterfall looks like a water curtain falling from a height of 10 meters. Its signature beauty comes from wildflowers, romantic paths and hills surrounding. 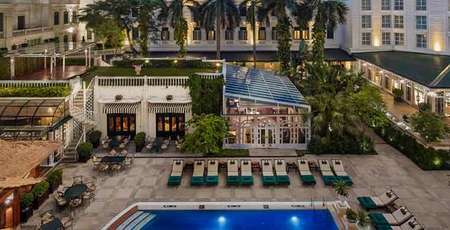 This is also a wonderful place to visit relax and enjoy. 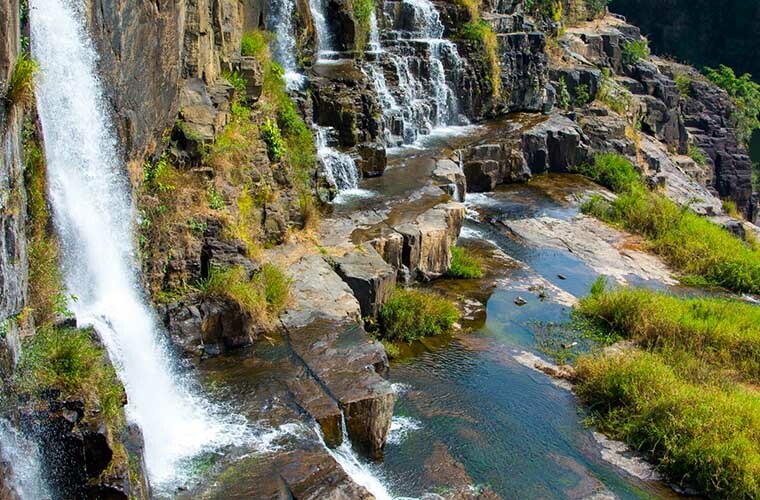 Located about 50km south of Dalat, Lam Dong province, Pongou is considered one of the most beautiful and majestic waterfalls in the western highlands of Vietnam. Coming to the place, you will be overwhelmed by the waterfall with the height of 40m and the width of 100m. In the midst of the mountains, the Pongour Falls looks extremely majestic and the scenery is more stunning with hundreds of wild flowers that cover the romantic path leading to the waterfall. If you can see water flowing into the large lake in the rainy season (from April to October) then you will be overwhelmed by the large rocks at the base of the waterfall in the dry season (from November to March). This is a convenient place for you to go camping, enjoy the cool atmosphere as well as the charming beauty of the waterfall. At the same time, visitors also have opportunity to see thousands of wild sunflowers blooming under the sunlight, which turn the road leading to the waterfalls into romantic pale yellow. 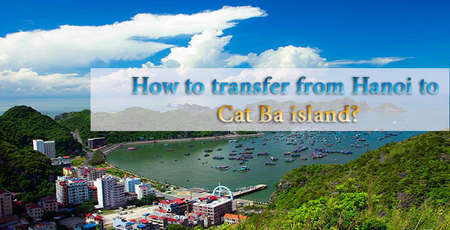 About 12 kilometers away from Sapa town center, Thac Ba can be reached by means of coach or motorbike, which takes you about 30 minutes. On sunny days, Thac Bac is imagined to be a white dragon when you take a look down from Ham Rong top. Just enjoy the cool weather and magnificent views in this mountainous area. For those who are interested in mountain trekking, a combination of bushwalking into Sapa valley and Thac Bac exploring would be a good choice.